"My father believes in a condition called 'the gin meanies.' He invented this cocktail to satisfy his taste for gin, while allowing him to slightly dilute its effects with vodka. His passion for this concoction quickly spread to my friends, who have been known to throw parties solely to celebrate him and his martini." Measure the vodka and gin into a cocktail shaker and add a generous scoop of ice cubes. Secure the lid and shake until the outside of the shaker becomes frosty cold. Strain into two martini glasses. Garnish each drink with two olives speared on cocktail picks and a twist of lemon. 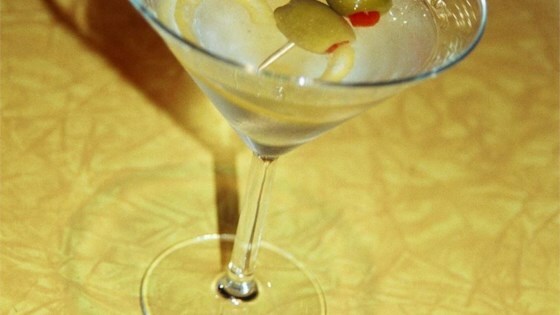 The combination of the vodka/gin and the olive/twist give this martini a smooth yet international flavor. One part Brit one part American ingenuity. Who needs 007's concoction after this mart? I love a good martini and I must say this is one of the best,will be making it again. And.... I might not share. great martini. all my bar friends love this drink, we had our local establisshment put it on the lunch menue. This is a great martini. Not sure why it is so smooth, but is. Be careful, this is strong drink. I accidentally doubled the recipe. It was still a wonderful drink. Very smooth and not bitter as I thought it might be. A perfect drink for sipping slowly. Best martini I've ever had!